The alpha rhythm is the most prominent feature of the normal mature EEG. It typically is identified first during the review. Beta activity refers to a frequency band rather than a distinct (specific) rhythm such as alpha or mu. Beta activity is commonly present in the EEG of healthy people. However, it is often difficult to see because of its low amplitude. A 10-second segment showing a well-formed and well-regulated alpha rhythm at 9 Hz. Note that it is very regular, rhythmic, waxing and waning, and posterior dominant. The contrast between the first and second halves of the page illustrates the reactivity of a normal alpha rhythm, with attenuation upon eye opening. Fleeting alpha. At times, as shown here, the alpha rhythm can be identified only in very brief bursts and often immediately after eye closure. If normal in frequency, this is normal. This is an example of an alpha rhythm with a wider distribution than is typical. If frequency and reactivity are normal, this is another variation of normal. 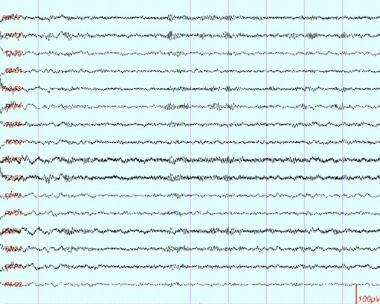 A similar EEG pattern can be seen in patients in a coma (ie, alpha coma), but in these situations it is usually unreactive. This is an example of "slow alpha variant." The patient's alpha rhythm at 12 Hz is seen in the second half of the sample. The first half shows a subharmonic at half that frequency, and this is the "slow alpha variant." An example of a typical normal alpha rhythm, showing clear attenuation upon eye opening (second half of page). Alpha rhythm with somewhat "spiky" or sharply contoured morphology. When fragmented (eg, in drowsiness), this can be misinterpreted as sharp waves. 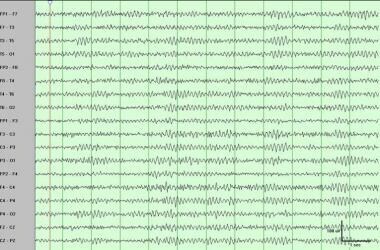 A sample of awake EEG showing the normal or usual amount of beta activity. As shown here, beta activity is often easier to identify during relaxed wakefulness or early drowsiness. This is the normal amount of beta activity, frontally predominant, with waxing and waning amplitude. Mu rhythm over the left (greater than right) central region. To be absolutely certain that this is a mu rhythm, reactivity should be tested. However, morphology (not absolutely typical but fairly so), frequency, and distribution strongly suggest that this is a mu rhythm. Occasionally the alpha rhythm is of very low amplitude or even not identifiable. This is not abnormal. In addition to amplitude, other characteristics can vary somewhat without being abnormal, including morphology (eg, spiky), distribution (eg, widespread), and harmonic frequency (eg, slow or fast alpha variant). In healthy individuals, beta activity commonly can be mildly different (< 35%) in amplitude between the 2 hemispheres, which may be caused by differences in skull thickness. Definite focal, regional, or hemispheric difference (at least 50%) in amplitude may be significant and may suggest either skull defect (side with higher amplitude) or a structural lesion (side with lower amplitude). The amount and voltage of beta activity is enhanced by commonly used sedative medications (benzodiazepines, barbiturates). Asymmetry, unilaterality, or asynchrony of the mu rhythm is generally not abnormal unless associated with other abnormalities. Very high-voltage mu activity may be recorded in the central regions over skull defects and may become sharp in configuration, and thus can be mistaken for epileptiform discharges. When mu rhythm is detected in an EEG, it should be verified by testing its reactivity. 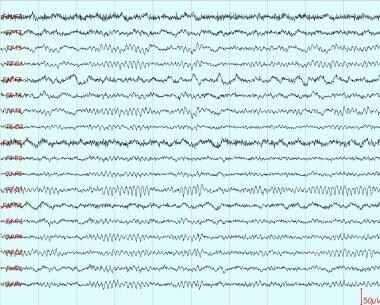 What are the features of a normal awake EEG? 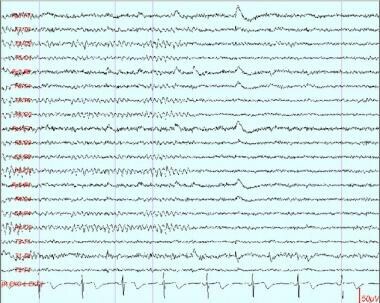 What are the characteristics of normal alpha rhythm on EEG? 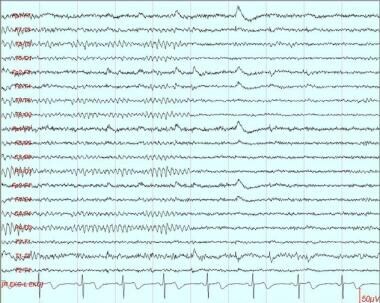 What are the characteristics of normal beta activity on EEG? 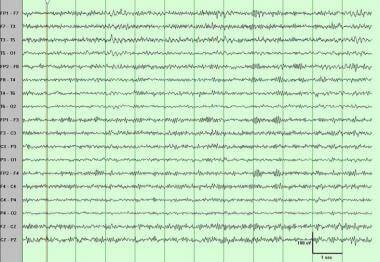 What are the characteristics of the mu rhythms on EEG? What are the variances in normal alpha rhythm on EEG? 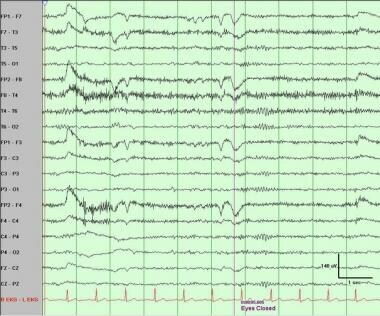 What causes differences in normal beta activity on EEG? 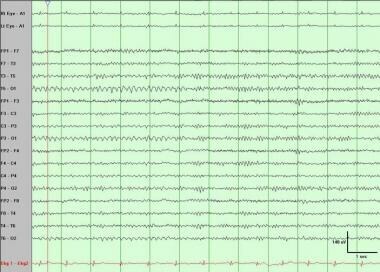 What are the variances in normal mu rhythm on EEG? Benbadis SR. Introduction to EEG. Lee-Chiong T, ed. Sleep: A Comprehensive Handbook. Hoboken, NJ: Wiley & Sons; 2006. 989-1024. Pfurtscheller G, Stancak A Jr, Edlinger G. On the existence of different types of central beta rhythms below 30 Hz. Electroencephalogr Clin Neurophysiol. 1997 Apr. 102(4):316-25. [Medline]. McFarland DJ, Miner LA, Vaughan TM, et al. Mu and beta rhythm topographies during motor imagery and actual movements. Brain Topogr. 2000 Spring. 12(3):177-86. [Medline]. Arroyo S, Lesser RP, Gordon B, et al. Functional significance of the mu rhythm of human cortex: an electrophysiologic study with subdural electrodes. Electroencephalogr Clin Neurophysiol. 1993 Sep. 87(3):76-87. [Medline]. Pfurtscheller G, Neuper C, Krausz G. Functional dissociation of lower and upper frequency mu rhythms in relation to voluntary limb movement. Clin Neurophysiol. 2000 Oct. 111(10):1873-9. [Medline]. Pineda JA, Allison BZ, Vankov A. The effects of self-movement, observation, and imagination on mu rhythms and readiness potentials (RP's): toward a brain-computer interface (BCI). IEEE Trans Rehabil Eng. 2000 Jun. 8(2):219-22. [Medline]. Benbadis SR. Focal disturbances of brain function. Levin KH, Luders HO, eds. Comprehensive Clinical Neurophysiology. Philadelphia, Pa: WB Saunders; 2000. 457-67. Smith SJ. 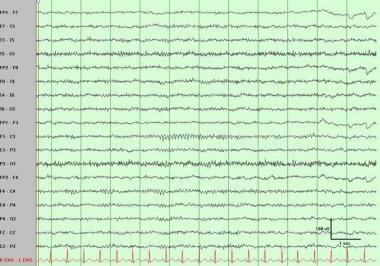 EEG in the diagnosis, classification, and management of patients with epilepsy. J Neurol Neurosurg Psychiatry. 2005 Jun. 76 Suppl 2:ii2-7. [Medline]. Smith SJ. EEG in neurological conditions other than epilepsy: when does it help, what does it add?. J Neurol Neurosurg Psychiatry. 2005 Jun. 76 Suppl 2:ii8-12. [Medline]. Kamarajan C, Porjesz B. Advances in Electrophysiological Research. Alcohol Res. 2015. 37 (1):53-87. [Medline]. Thorpe SG, Cannon EN, Fox NA. Spectral and source structural development of mu and alpha rhythms from infancy through adulthood. Clin Neurophysiol. 2015 Mar 20. [Medline].